I’ve got a new feature here on Shugary Sweets today. It’s called: Reader’s Choice! Last month I asked a question on facebook asking “if there is ONE recipe you’d like to see me create what would it be?” Well, Cynthia R. this one is for you! 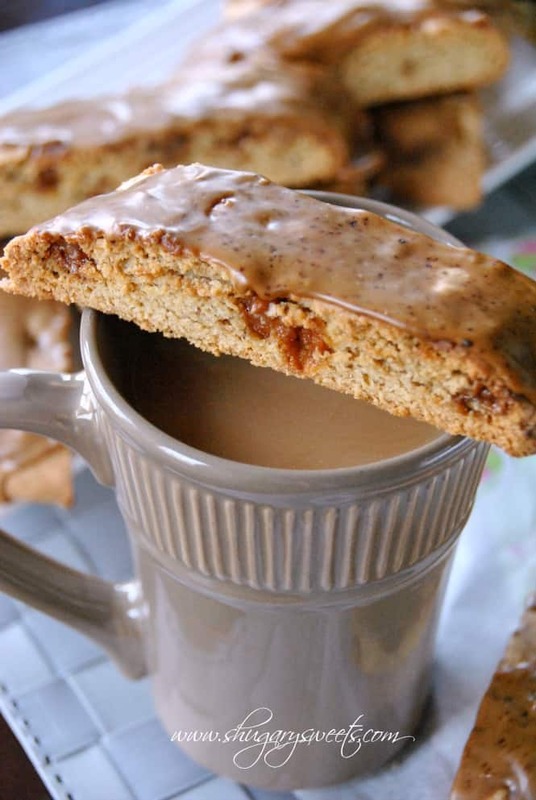 You asked for Caramel Macchiatto Biscotti (like Starbucks). You had me at biscotti. I love biscotti. I seriously should have a category up there just for biscotti. Think about it. It’s a cookie. That you are allowed and encouraged to eat for breakfast. To dunk in coffee. YES. YES. YES. I tried to find this biscotti at my local Starbucks but they had no such thing. So, I have no idea what to compare mine too, or if it even needs comparing. These are amazing. I store my biscotti in ziploc bags on my counter to keep them fresh. This one lasted nearly two weeks. I tried to limit myself to one per day (and no, the kids were not allowed to indulge in these). Not because of the espresso, but because I was greedy and didn’t want to share! You’ll understand when you make them for yourself. And please don’t be afraid of biscotti. While is sounds like a snooty type of breakfast food that only Europeans know how to make…IT’S NOT. Biscotti is actually quite easy to make, and very forgiving. Mix ingredients, shape into a rectangle with finger tips, bake, slice, bake again. Delicious biscotti in one hour. You CAN do this!! Want more biscotti ideas? Well you’ve come to the right place. Once you make your first version, you won’t be able to stop. You’ll be like a bakery with lots of options every morning! If you’re not following me yet, make sure you find a way to keep up with the latest at Shugary Sweets. I want to hear from YOU and what YOU would like to see featured next month on Shugary Sweets! I also have TWO awesome giveaways in February and already lined up another HUGE giveaway in March! You don’t want to miss these. Plus, aren’t you curious to know what’s going on in my kitchen every day? 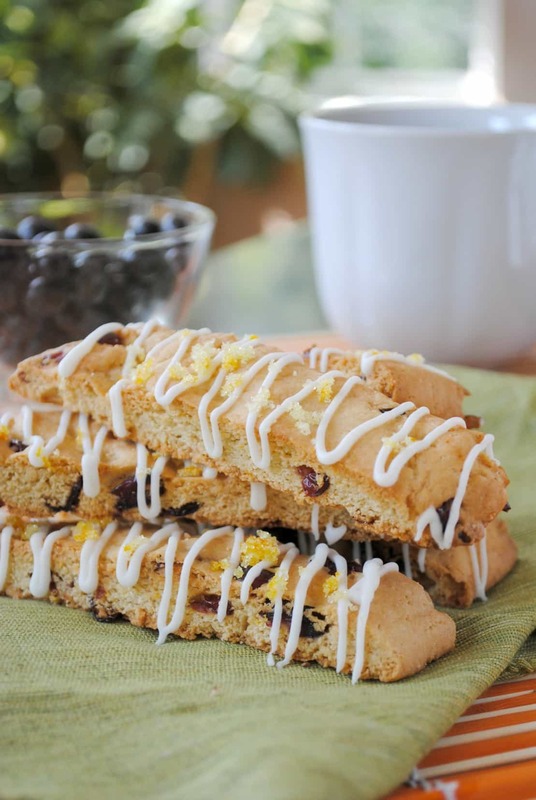 Cranberry Orange Biscotti: orange zest with Craisins combine to make this crunchy variety. Topped with white chocolate and sugared orange zest. Great combination! 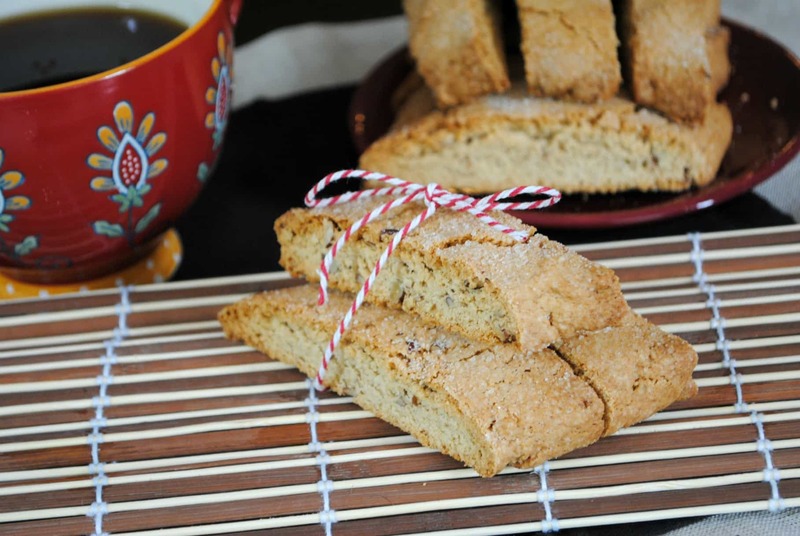 Snickerdoodle Biscotti: cinnamon and sugar are sometimes so simple but powerful flavors! Pumpkin Spiced Biscotti: delicious any time of year. TRUST me! Pumpkin, ginger, cloves, allspice…it’s like pie in a cookie. Turtle Biscotti: Yes, seriously, you can now have turtles for breakfast and it’s OK. Caramel, chocolate and pecans. For Breakfast. Stop on over to my Pinterest Board: Breakfast Table Goodies for more ideas!! 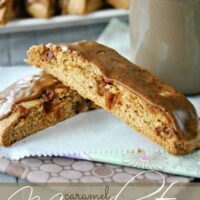 Homemade Caramel Macchiato Biscotti recipe! In a mixing bowl, beat butter with sugar until creamy. Bean in eggs, espresso powder and vanilla. Add flour and baking powder. Fold in caramel bits. Batter will be sticky. Divide dough in half and form two 10x3 inch logs on a parchment paper lined baking sheet. Bake in a 350 degree oven for 25 minutes. Remove and cool about 10 minutes. Cut into 1 inch slices and arrange slices upright in pan. Bake an additional 20 minutes. Remove and cool completely before glazing. For the glaze, whisk all the ingredients together until smooth. Spread onto cooled biscotti. Allow to set, about 15 minutes. Store in airtight container up to two weeks. Oh my oh my these look wonderful! Thank you Cynthia for asking for these! I would love to have one of these with my coffee right now. I can’t thank Cynthia enough either! I wish you had some for your coffee too! For some reason I can’t see your biscotti 🙁 and now I’m sad because I love biscotti AND I love your recipes. Pout. Any idea why I’d be having trouble? I’m not sure why you can’t see them! Like the photos aren’t showing up? Are you on a mobile device? Hmmm, I need to investigate this Jess! AGH so sorry do not investigate further it was totally my fault. Well, really, it was FireFox’s fault >_< I switched to Internet Explorer and I can see them just fine 😀 And they are gorgeous! Caramel Macchiato is one of my favorite specialty coffee drinks. And now in a biscotti? That sounds fantastic! Thanks Regina! It’s a fantastic drink. 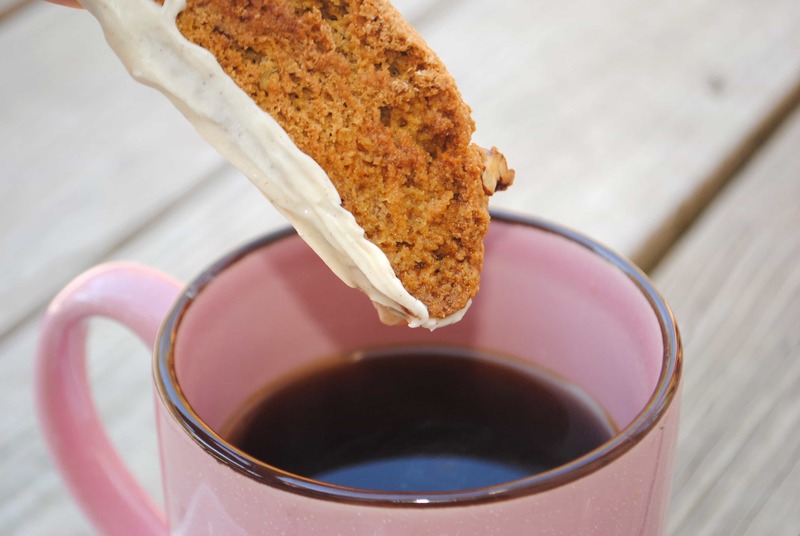 Now you need to dip this biscotti INTO a caramel macchiato haha! oh. I love biscotti as well. Sounds awesome. Thanks Meg! Glad you love biscotti too! biscotti is not usually my thing but oh man… i can get on board with this Aimee. I love caramel so much, I couldn’t pass one of these up! And caramel macchiatos are just the best. I get them every few weeks when I stop at Starbucks!! Oh girl, I could eat biscotti every morning with my coffee! I’d much rather have it than a doughnut. Oh wait. Maybe not. These look amazing! I love biscotti. There are so many flavor possibilities. I am especially excited to find a biscotti recipe with tons of flavor that doesn’t use nuts. Thank you! Nope. No nuts needed in this recipe. ENJOY! What kind of espresso powder do you use? The reason I never make coffee-flavored treats is because I can never remember to buy the instant stuff! Aimee…love your recipes. I bake them also and sell at our local food co op. My business is called Peace, Love and Biscotti! Started baking orange cinnamon from a recipe I found in Bon Appetite about 15 years ago. I don’t bake much else than biscotti but people love it. I only use King Arthur Flour and will have to get their espresso powder. 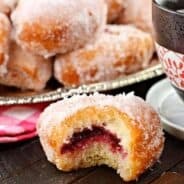 Glad I found your site and keep baking!! Thanks Nancy! I love Biscotti!! It’s fun doing readers choice and hearing what THEY want me to make!!! can’t wait to do it again! 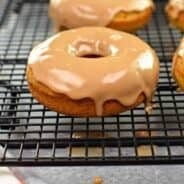 That glaze almost made me lick the screen. These look incredible! Sorry about that! Okay, no I’m not! My sentiments exactly Patricia! I couldn’t have said it any better! It’s great being the adult sometimes!! You’re so sweet! Thank you !! I love Biscotti! It’s so good and yes I love to dunk it in my coffee! Bring the Biscotti on! The caramel macchiato looks out of this world!! Oh my! Can I have these for breakfast now please! Oh.My.Gosh. That’s all I can say, without drooling more. I’m so with you on biscotti – maybe it has something to do with the whole my entire family is Italian and we had it all the time when we were growing up! But this version! Holy moly I’m in love. I would have never thought to make a flavor like this… I totally need to give this a try! thanks Ashley. Yikes, an Italian trying one of my biscotti recipes? I hope you approve! I make no claims to authenticity 🙂 Just delicious. Oh my goodness. I’ve never made Biscotti (not because it sounds fancy but.. okay, because it sounds fancy), but you are like, my Biscotti sensei and therefore, I must try my hand at it myself as a young Biscotti grasshopper. I want this one to dunk in my chai! Yes young grasshopper, you must try biscotti soon!! I love your challenge to everyone that they can make biscotti! Oh wait, maybe that was to me too because I have actually never made any 🙂 How about I come over and have some with you..will you share with me??? Never made any? Seriously girl, and you call yourself friend. Okay kidding, I’d love to have you over and share some biscotti with you! I made my first biscotti in December and can’t stop. I need to add this to my lineup recipes to make. Oooh, what flavor did you make in December? I seriously love these little breakfast cookies! Oh my! 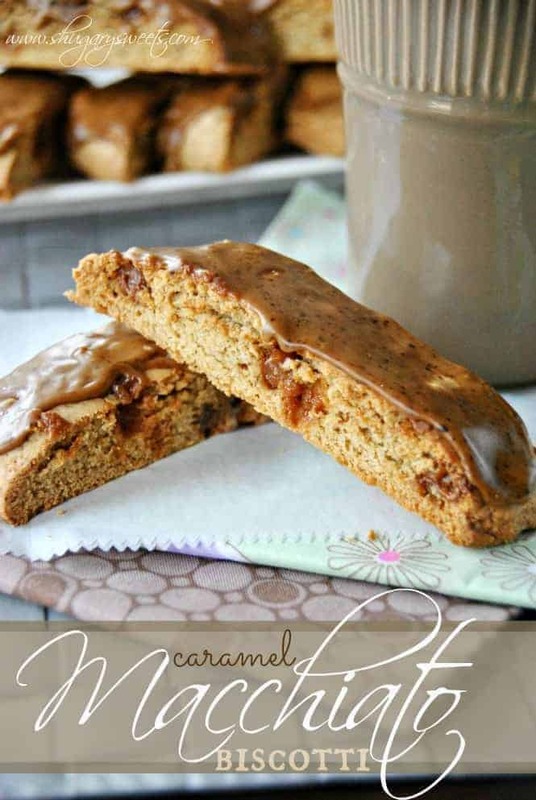 I love biscotti and these Caramel Macchiato ones look so decadent! I’m craving for some now. I guess it’s time for me to get into the kitchen and make a batch. Yes, I think you must Amy!! I have tried biscotti only once and wasn’t really impressed. But these! These could change my mind! I LOVE caramel macchiato! Pinning! Iced Caramel Macchiato with extra caramel is my favorite drink at Starbucks. I think these biscotti are the start to a beautiful friendship! Biscotti and coffee is perfect on a cold winter morning. Totally agree Kelly! I don’t make enough biscotti…and caramel macchiato is my go-to Starbucks drink. These are perfect! I want to dive in!! 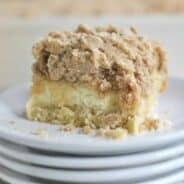 I wanted to let you know that I featured this deliciousness today in my “What I Bookmarked This Week” post – stop by and see! Wow. I love these! My favorite Starbucks drink is the Caramel Macchiato! And I LOVE biscotti, especially dunked in coffee. Then you will ADORE this biscotti!!! I love biscotti and don’t make enough of it. I am bookmarking this gorgeous recipe. Have never seen Kraft caramel bits here in Ontario, would Skor toffee bits work, do you think ? That’s what I’m going to use…..I use the toffee bits in a specialty cake I make and they melt down. I think it will work. Just my opinion though since I haven’t tried it yet. I would lean towards using a soft caramel. Do you have wrapped caramels? You can dice them up for this recipe. In a pinch though, the toffee bits would totally work, you just wouldn’t have that little bit of “chewy” in your biscotti! when I first tackled biscotti several Holidays ago, I started w/ almond biscotti (still my fav.) and have moved on to a couple diff. ones since. Believe me, it is very easy to make. Christmas instead of the usual cookies. I always add some on the gift plates now. I know this is an older post but I made these today and they are delicious! Turned out perfect and I followed the exact recipe. Thanks for sharing this. Next, your red velvet biscotti ???? It’s Perioperative Nurses week and I hope they love them! Made these today! They are perfect! I had extra glaze, so of course I had to eat it with a spoon. So good!